There are more people hoping to be a pickleball coach in their local area than ever before. While some amateurs can help your game by leaps and bounds, many (even some pros) may inadvertently be teaching you ineffective strategies or bad habits. It’s also important to note that the best players do not always make the best coaches and that the best coaches are not always the top players. Think about those shrimpy basketball coaches. They might never be able to dream of hitting a slam dunk, but that’s pretty irrelevant when you’re talking about whether or not they can get their team to the finals. Similarly, just because someone has dozens of medals or national standing, doesn’t necessarily mean that they have the explicit knowledge, insight or patience to make a great coach. #1: Where Do You Teach? It may seem obvious, but often a pickleball coach will only teach in a limited geographic area. You could find the best coach ever but if they won’t come to your neck of the woods, what good is it going to do you? #2: What’s Your Racket Sport Background? Not every pickleball coach HAS to have a racket sport background, but most will. It’s good to to know so that you can be aware of any possible biases that may show up in their coaching. For example, a pickleball coach who is coming from a tennis background is likely to tell you to keep your wrist locked when you hit the ball, (since to do otherwise with a tennis racket is likely to lead to injury, if it’s even possible). A table tennis or badminton player, however, might encourage you to take advantage of the flexibility in your wrist more. #3: What’s Your Experience and/or Credentials as a Pickleball Coach? You probably want to make sure that your pickleball coach has at least a couple years of experience playing pickleball, and you DEFINITELY want to make sure that they have experience playing in the 5.0/Open division of the bigger tournaments (or even nationals). I can’t say how many times I hear about the “big wig” pickleball player in a small town, then get there to find out that he’s really just a big fish in a small pond… and if he WERE to venture out to play pickleball with the top players, he’d get creamed. Make sure that guy’s not your coach, okay? ‘Nough said. Now, not only do you want to make sure you’re working with an experienced player, you should make sure you’re working with an established coach. How long have they been coaching? How many people have they worked with? Who are they endorsed by? What do their previous students say about them? What instructional materials have they created (books, dvds, etc.)? Are they well-known and well-appreciated in the pickleball world? How large is their following? The answer to any one of these questions doesn’t necessarily mean anything, but combined, they can give you a good idea of the caliber coach you are dealing with. #4: What’s Your Approach to Teaching Pickleball? If so, they are likely to try to change the parts of your game that ARE working for you, just because it isn’t exactly the method that they teach. There’s nothing worse than being lectured to for an hour non-stop. Not only is it boring, but there isn’t much that you actually absorb. You’ll be lucky to remember and implement one thing after attending a lecture-based pickleball class or clinic. Only slightly better than a lecture, is when the pickleball coach teaches you what to do, has you practice a couple times and then sends you home. Again, you’re not likely to make any real change if you don’t get plenty of drilling in to build that muscle memory. #5: How Much Do You Charge? In life, you get what you pay for. There’s no doubt that there are MANY (probably hundreds) of folks out there offering free or cheap lessons, clinics or practice sessions. I know many of them and most are just good-hearted people who truly do a service to their pickleball community. But there is a big difference between someone mentoring some friends and a professional pickleball coach. If you’re really serious about improving your game and you truly want the best, then you should expect to pay for the best. Any coach worth his or her salt will be charging accordingly. Just think about it. If Nadal or Federer were offering tennis lessons for $50 an hour you’d be wondering one of two things… either they’ve gone crazy or you’re not working with THE REAL DEAL. If you want the best pickleball coach, you want to make sure you’re learning from THE REAL DEAL. Bonus Question #1: Will Their Method Actually Work for ME? If your pickleball coach is young, quick and strong, they may be teaching a style that depends upon being young, quick and strong. That’s great, of course, if you are. But if you happen to be… well, I won’t go ahead and call you the opposite of those things, but you know what I mean… if you are NOT young, quick and strong, then those strategies may not work as well for you. Bonus Question #2: Will I Get Generic Suggestions or Feedback That’s Unique to Me? Many coaches only know how to teach someone “the right way” to hit a shot, but they may not actually be able to see the subtle things that are making you hit the shot “the wrong way”. They may teach you, for example, to bend your knees and keep your head down as you hit the ball, but they may not have the insight to tell you that when the ball is coming to your backhand, you are bringing your head up right before you hit the ball. Having that kind of specific feedback as to the nuances of what you are actually doing right and wrong can make a tremendous difference to your game. 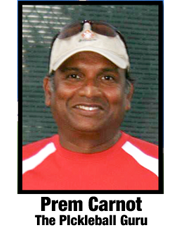 Prem Carnot, The Pickleball Guru, is an international pickleball coach and author of the Amazon.com #1 Best Seller, Smart Pickleball: The Pickleball Guru’s Guide. He teaches interactive, hands-on clinics with plenty of drills on-location across North America and in Europe. He was the runner-up in the French National table tennis tournament and has put those skills to use playing pickleball since 2008 and as a full-time pickleball coach since 2012. His students rave about his “eagle eye” to zero in what they’re doing wrong combined with his simple, straight-forward explanations so they can learn how to dramatically improve their game — without having to get younger, faster or stronger. Does pickleball affect your personal relationships?